AMD Shares Plummet More Than 13.4% After Decline in Q4 Guidance - Seasonality Or End Of The Bull Run? AMD Shares Plummet More Than 13.4% After Decline in Q4 Guidance – Seasonality Or End Of The Bull Run? 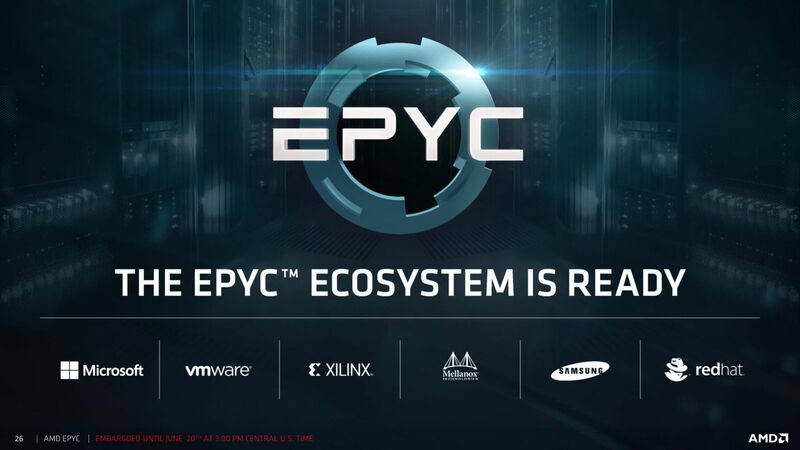 AMD's EPYC ecosystem showed less than expected growth and is one of the many reasons for AMD's stock dip. AMD (NASDAQ:AMD) shares have plummeted more than 13.4% after CEO Lisa Su guided a revenue drop of 13-18% sequentially. The company recently turned the ship around but immediately saw its shares drop in the wake of lowered guidance for Q4 2017. AMD has always been a stock that was especially vulnerable to market forces and this change in pace can be viewed as a warning indicator for market sentiment. AMD stock has historically undergone seasonality based revenue decline in Q4 but since this news comes immediately after new products were introduced to the market (Threadripper and Vega) and in the wake of slowing crypto-powered sales the market has reacted negatively to the announcement. The company operates on relatively thin margins and was able to turn a profit because of the increase in revenue seen this quarter, that’s not in question, but the quality of that revenue is what is potentially problematic. 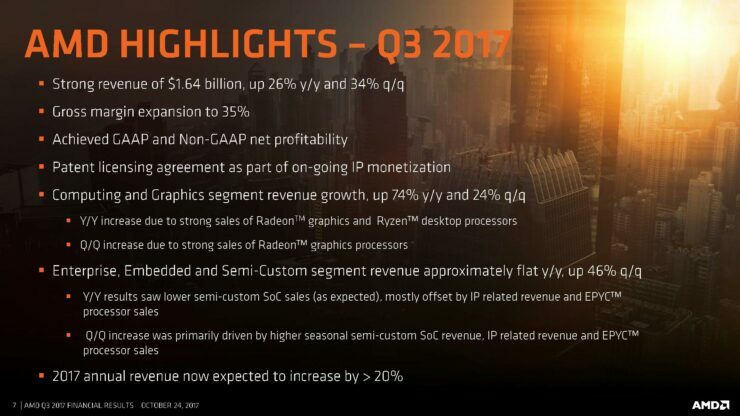 Taking AMD’s guidance into account, the results for next quarter are definitely in the grey and going back under is very much a real possibility. AMD’s gross margin rate of 35 percent was short of what investors may expect given a higher revenue profile and more favourable mix of new products. Data centre also showed flat growth which performed lower than analyst expectations and was overshadowed by the graphics department which was riding the ongoing cryptocurrency boom. Fearing a possible downturn in what is already a risky stock (RiskGrade 300) due to the company going back under next quarter, investors started pulling out, wiping almost $1.35 Billion off the company’s market value. Keep in mind however, that due to seasonality, AMD’s revenue has always fallen in the fourth quarter. The bull run however, was based on AMD turning a profit (something which can reverse next quarter), so it makes this a very critical point for an AMD investor. Both JP Morgan and Morgan Stanley have commented on the decline, citing a mix of revenue upside coming primarily from graphics and consoles rather than the more sustainable CPU business, higher than expected costs as well as increased competition from Intel with the two banks both rating AMD at Neutral. This shows how difficult it can be to transition from being a growth stock to a sustained value generator, something that AMD is grappling with right now. Over the medium to longer term, AMD likely represents a reasonable investment due to its ability to slowly reduce its dependency on Global Foundries and a seemingly decent product roadmap. Market share gains are cited by the JP Morgan analyst Harlan Sur as likely to be modest in the immediate future however given an aggressive shift from Intel on the product side since AMD burst back onto the CPU scene in the shape of Ryzen, there is risk here. Investors should also keep in mind that as companies move away from the promise and tease of great new roadmaps and into the execution phase, analyst expectations become more important than the hype train and average investors who jump on the bandwagon become less of a factor to stock appreciation. Quality of earnings rather than just the top level numbers themselves start to take on more weight in the valuation game and large fund portfolio balancing also comes into play more. Ultimately, anyone who thought that AMD was now a success story on the back of a single quarter of profitability has learnt a sharp lesson. Sustainable growth is the name of the game and that takes time to achieve. AMD has so far done a reasonable job of turning the ship, but it’s a big ship and the turning still needs to continue.